In just 12 short days, Game of Thrones will finally return with the Season 6 premiere The Red Woman, airing Sunday, April 24 at 9 PM ET on HBO. Fans have been clamoring for new details ever since Season 5 ended in quite the shocking fashion, with the deaths of Jon Snow (Kit Harington) and Stannis Baratheon (Stephen Dillane), not to mention the blinding of Arya Stark (Maisie Williams), Sansa Stark (Sophie Turner) and Theon Greyjoy's (Alfie Allen) daring escape from Winterfell, and much more. Today we have new interviews from TV Line and Entertainment Weekly, which shed light on the plights of Arya, Sansa and Finn Jones' Loras Tyrell. 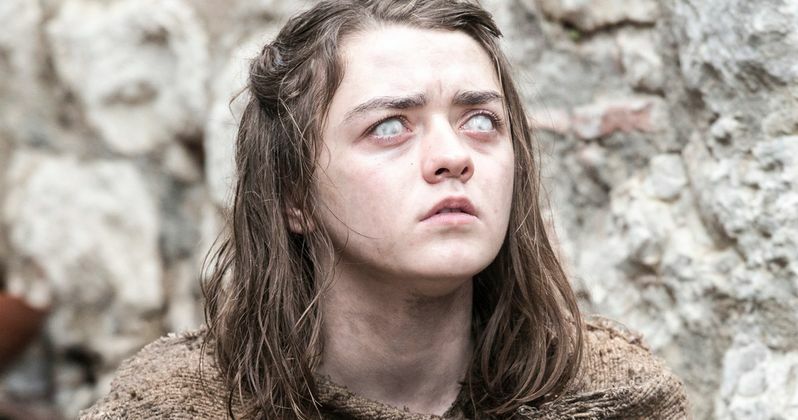 As for Arya, she was blinded by her mentor Jaquen H'gar in the Season 5 finale, after she crossed off one of the names on her infamous list, killing Meryn Trant (Ian Beattie). Although his life wasn't hers to take. The new trailer that debuted yesterday showed Arya practicing her swordplay skills with The Waif (Faye Marsay), who has tormented Arya ever since arriving at the House of Black And White in Season 5. While Maisie Williams wouldn't offer too many details about these sparring scenes, she did praise both the stunt doubles for herself and Faye Marsay. "I've had stunt doubles before where - they were lovely girls - but they didn't look like me. I didn't buy it. Like, I don't look at you from behind and think that you look like me. And that means the audience is gonna be the same. They're gonna be like, 'That's not Arya!' And instead of watching a fight scene like, 'Oh my gosh girl, get up! Get up!,' you're going to be going, 'That wasn't even Maisie!' They were so great, and they were absolute troopers. They were so fit and incredible and made us look really, really good at fighting. Faye and I were pretty good at fighting, as well, but they were much better than us. There was a good balance between the two. Sometimes, it's us." Throughout the series, Arya has been portrayed as a fighter who keeps mental list of enemies that she wants to kill, to avenger the deaths of her family members. Her sister Sansa (Sophie Turner) has never really shared the same vengeful mentality as her sister, but TV Line also spoke to Sophie Turner, who teased that Sansa will start going after her enemies in Season 6. "All of this injustice has happened to her the past five seasons. Now it's about her getting revenge on people who have completely destroyed her life right from the beginning. [Season 6] is about her - step by step - trying to eliminate the enemy. This is the season where she's starting to turn things around and people are starting to rally for her. She's trying to get people to listen to her. She's building a group of trusted people that will help her get what she wants, which is - ultimately - revenge." The big question that remains is, which "enemy" will Sansa try to eliminate first? We last saw her jumping over the Winterfell wall with the help of her old friend Theon Greyjoy, and we saw in one of the clips released yesterday that she hasn't gotten too far from Winterfell quite yet. It's possible her first target could be her former husband, Ramsay Bolton (Iwan Rheon), who brutally raped her shortly after they were married. She could also set her sights on the Lannister clan, who suspected that she was responsible for the poisoning death of King Joffrey (Jack Gleeson) back in Season 4, but we'll have to wait and see. Entertainment Weekly also caught up with Finn Jones, who plays Loras Tyrell. The last time we saw him in Season 5, he was convicted and thrown in jail for his homosexual lifestyle, but the latest trailer gave us the first glimpse of Loras thus far, as he's seen embracing his sister Margaery (Natalie Dormer), who is also behind bars, thanks to the High Sparrow (Jonathan Pryce). When asked about Loras' mindset in Season 6, the actor had this to say. "He's been left there to rot. He's in isolation. He's been treated very badly by a lot of bigots. We saw in Season 5 how they treated gay men in the brothel. These religious men and women don't take to gay people too nicely. He's having a very difficult time. This is also a character used to privilege and power. He's trained hard and excelled in his own talents and skills, but done that in the comforts of his surroundings. He's never been to war. He's a knight of summer, and now it's the complete opposite. He's never faced truly difficult challenges. Loras is definitely in a very tricky situation. His whole family is. They're going to be tested a lot. We're just going to have to hope that good prevails. I have resources on my side - I've got an amazing sister who cares a lot about me and a wicked grandma who's very savvy. Strong women on my team. I'm hopeful Ser Loras will survive, but it's not going to be easy and he's going to be tested - in more ways than one." It remains to be seen if Loras' aforementioned grandmother, Lady Olenna Tyrell (Diana Rigg), will be able to use her power to get both her grandchildren out of prison. Do you have any theories about what will happen to Arya, Sansa and Loras this season on Game of Thrones? Chime in with your thoughts below, and stay tuned for more updates as we get closer to the April 24 premiere.